Walter was born 8 February 1897 in Longford to a military family, his father being Colour Sergeant William Henry Beech, The Rifle Brigade, of 71 Eccleston Square, Victoria, London. In 1901 they were living in Mullingar Barracks. His older brother, Oscar, was born in India. He and his younger brother Arthur were born in Longford, and the youngest was born in the Curragh Camp, Kildare. By 1911 the family were living in Custom House, West Ham, Essex, where William was working as a telephone operator in a printing works. Walter enlisted in Stratford, Essex. At the time of his death Pte. Beech and his battalion were suffering from heavy losses each day from german attacks. It is likely that Pte. 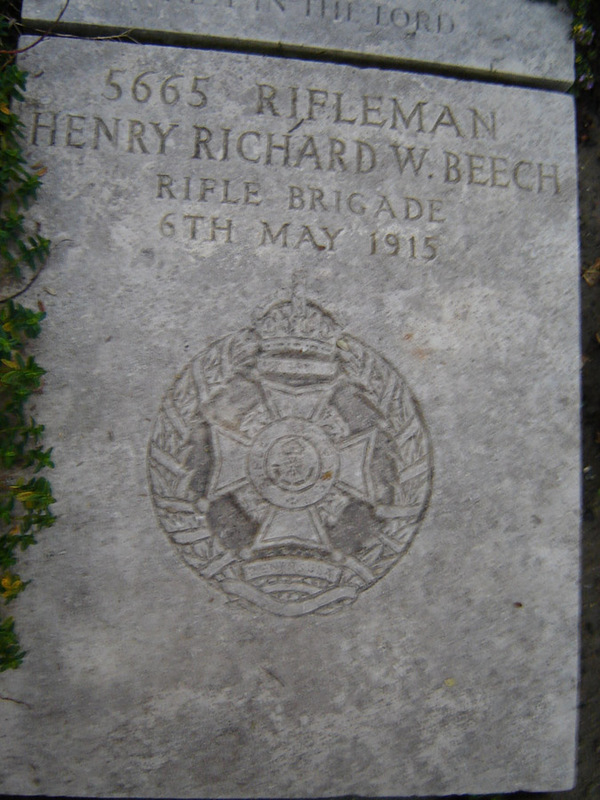 Beech lost his life during the Second Battle of Ypres, at the Battle of St. Julien. Son of Colour Sergeant William Henry Beech (born Beverly, Yorkshire) and Christina Agnes Beech (born Woolwich, Kent). Also known as Walter Henry Richard. Appears as Richard Henry in the 1901 Census. Given as Henry Richard Walter Beech in Ancestry records and Casualties of World War I, Ireland.